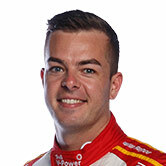 Scott McLaughlin set the fastest time in a Supercheap Auto Bathurst 1000 qualifying session that came to a sudden end with a crash for James Moffat. McLaughlin moved to the top halfway through the 40 minutes, clocking 2:04.4571s despite running wide at Forrest’s Elbow. He lowered the time to 2:04.3182s on his next run, before putting his superiority beyond doubt with a 2:04.2254s on a third set of tyres with less than a minute remaining. The Shell Ford's record-setting 2:04.1470s from the earlier Practice 5 session proved just out of reach, with track conditions appearing to have deteriorated slightly with the late afternoon sunlight. Click here for the full ARMOR ALL qualifying result. David Reynolds jumped from fifth to second on his final run, just 0.2476 seconds adrift of McLaughlin, moments before a crash for James Moffat on the entry to The Dipper ended the session 15 seconds early. Moffat had been ninth at the time of his hit, but with his fastest time deleted for causing the red flag, drops to 22nd in the order. The stoppage ended any chance that Jamie Whincup had of making the Shootout. He’ll start Sunday’s race 11th after struggling to make an impression throughout the session. Prodrive’s strong Mountain form continued with Chaz Mostert, Cameron Waters and Mark Winterbottom filling third through fifth and Jason Bright also making the 10 in ninth. 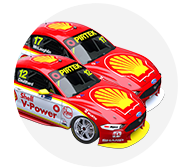 Fabian Coulthard made it five Fords in the top six ahead of Shane van Gisbergen, James Courtney, Bright and Garth Tander, who makes the Shootout after his team-mate Moffat’s error. All four Nissan’s missed the top 10, with Rick Kelly the best of its fleet in 12th, while Brad Jones Racing befell a similar fate as Nick Percat proved its top runner in 14th. Defending winner Will Davison will start the 1000 in 16th after touching the wall through Sulman Park and spending the final minutes of the session in the garage. "I was pretty committed, trying to scrape a tenth or two out of the car and got a bit of understeer," explained Davison. "I thought I was going to be OK, kept my foot in it, but just couldn’t quite get the front grip and grazed the wall. I was praying I’d got away with it just as wheel damage, and bent the lower control arm. "It’s not a disaster, but I’m shattered. I wanted to have a crack at the Shootout." Tekno Autosports’ garage partners TeamVortex fared even worse on the time sheets, with Craig Lowndes managing just 19th. Lowndes and his Triple Eight stablemate Whincup both had big offs through the Chase during the session as they fought to extract speed from their Holdens. A final practice session will take place tomorrow morning before the Top 10 Shootout, which is set to get underway at 5:10pm local time.